Thousands of folks across Vermont have worked hard over the last number of years to ensure the appropriate protection of those in vulnerable categories. The State continues to struggle to produce an environment that is safe for all. We have been advocating civilian oversight of law enforcement for this purpose. Our calls have fallen on deaf ears. We need your help to deliver the message. Act 54, updated Title 20, 2366 to require the Vermont Criminal Justice Training Council (VCJTC) and the Attorney General’s (AG) Office to bring the existing FIPP into compliance with immigration law and the VCJTC to create a cohesive FIPP. The FIPP was negotiated and revised, reviewed by the AG (to ensure compliance with federal immigration statutes), revised again and adopted by the Vermont Criminal Justice Training Council. As of March, 2018, all agencies have been under legislative mandate to adopt all components of the Council FIPP. Finally, Act 54 requires that the AG and the VCJTC review the FIPP of all agencies, no later than 15 April, 2018. Inconstant with process outlined in Act 54, the VCJTC changed the FIPP without the consultation of the Human Rights Commission in November of 2017. This was done in response to a threat from then Attorney General Jeff Sessions to withhold a grant valued at over five hundred thousand dollars. It is no wonder that now we find that the Vermont State Police have failed to adopt the FIPP, as required by law (Act 54). The “State Police Advisory Commission” SPAC is held out as the best example of oversight in Vermont. Seven days spoke of the ineffectiveness of the body in the Spring of 2018. Despite the conflict of interest being brought to the attention of the Assistant Attorney General over one year ago, Governor Scott reappointed Nancy Sheahan to Chair the SPAC. Sheahan, a partner at the Burlington firm McNeil Leddy & Sheahan is “a go-to lawyer for Vermont cops who have been accused of mistakes or wrongdoing.” All of this and in almost EVERY instance, law enforcement are cleared from any wrongdoing by the States Attorney or the Attorney General. Act 147 (2016) updated Title 20, 2358, requiring all law enforcement to attend “anti-bias training approved by the Vermont Criminal Justice Training Council and training on the State, county, or municipal law enforcement agency’s fair and impartial policing policy”… On or before December 31, 2018”. There is no indication that this deadline will be met by Vermont law enforcement. In early December, 2018, it was discovered that the State Police were scheduled to attend a program that brings local law enforcement to Israel for training with the Israeli military, police and secret service. Local activists organized and petitioned and the state police pulled back on their plans to attend. Despite our calls, there remains no consistent appropriate use of force, de-escalation and cross cultural awareness training across the 79 agencies in Vermont. VTDigger.org reported Monday (January 7, 2019) that an investigation by the Burlington Police Department found that Officer Erin Bartle and two others sustained injuries such as concussions and hearing loss during an academy drill known as the “hitchhiker scenario.” A fourth officer was knocked unconscious. During the drill, instructors punched recruits in the head without warning. Bartle is suing the Vermont Criminal Justice Training Council, which oversees the academy. Read the latest update in this gross negligence of oversight and threat to public safety here. That the people of this state by their legal representatives, have the sole, inherent, and exclusive right of governing and regulating the internal police of the same. investigate compliance with Title 20, 2366 and 2358.
execute its constitutional responsibility to be accountable to the people by “governing and regulating internal police” with sufficient civilian oversight of law enforcement. codify remedies for law enforcement violations of Title 20, 2366 and 2358.
mandate the incorporation the collection of use of force data into the existing traffic race data collection data set outlined in Title 20, 2366.
mandate that all law enforcement agencies be required to undertake appropriate use of force, de-escalation and cross cultural awareness training (and in service). Hold the Public Safety commissioner accountable for racial equity in enforcement. remove Nancy Sheahan from the State Police Advisory Commission. ﻿Contact the Attorney General and demand that he conduct a formal investigation into adherence to Title, 20, 2366 an 2358 and hold the Public Safety Commissioner accountable to the law. 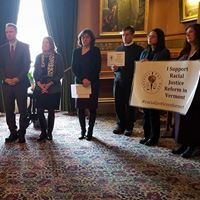 Reach out to your legislator and legislative leadership and demand public hearings and and other requests above to protect Vermont’s most vulnerable.